Muscle with beauty! If you are looking for a work truck that is solid, has best in class fuel economy, and impressive towing/payload ratings then this RAM 1500 is a great choice. When it comes to ride quality experts argue that this RAM 1500 offers best-in-class driving comfort due to an ingenious multi-link and coil spring rear suspension setup. On top of power and performance, this truck also has an upscale and high quality interior cabin that makes a tough work day little more pleasurable. 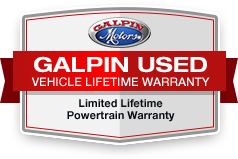 Call us today to make this truck your next work companion and experience 'Galpin Used Car Difference'. All figures are EPA estimates. Actual mileage will vary. Kelly Blue Book values are calculated based on the current Retail Book. Pricing analysis performed on 4/5/2019. Fuel economy calculations based on original manufacturer data for trim engine configuration.